This was the second time Miami police went out to the home in recent weeks. Previously, there was a “suspicious lurker” outside the home. A suspect was never apprehended, and Wayne was also not home for that scare either. Ultimately, Wayne was never at risk because the police call turned out to be a hoax. TMZ deemed it a case of swatting, which Urban Dictionary defines as “a goal achieved by hacking where the hacker tricks 911 systems into deploying SWAT to an unsuspecting victim’s home under false pretenses.” Considering that Lil Wayne has been previously arrested on gun possession charges, for which he served eight months in prison, who decided to mess with Lil Wayne like this? He is known to have weapons! While he may not anymore, why take the chance here? This is one bold prankster. The Miami PD confirmed it was a swatting call, while also revealing Wayne’s address. I think it’s time to move, Weezy. #UPDATE unfortunately this appears to be a "Swatting" call. No victims /no injuries /no subject at 94 LaGorce. Page Six spoke with a few witnesses, all of whom had effusive praise for Ford. One guy named Eddie Aguglia said, “The fact [Ford] kept his wits about him was pretty miraculous … There were a lot of people on the ground that could have gotten hurt, but he avoided them.” That’s nice, but who cares what this random Eddie thinks about his crash landing? Likely anticipating this response, Page Six also got something of an expert — Christian Fry, vice-president of the Santa Monica Airport Association — to weigh in. 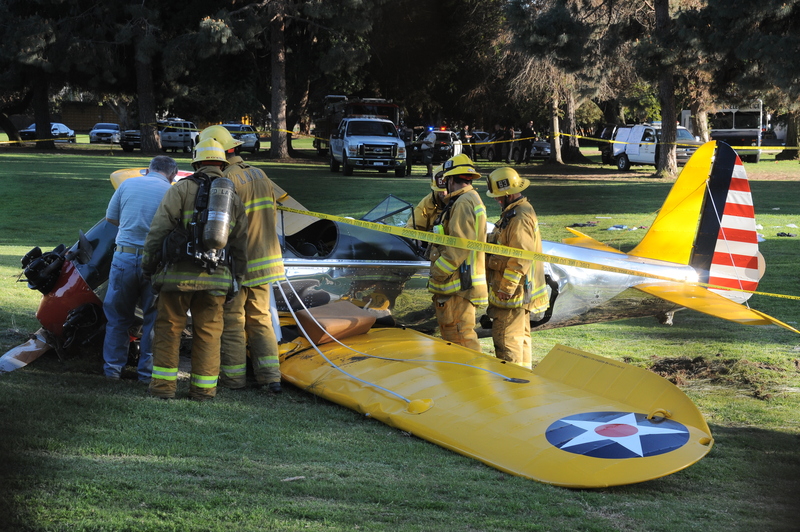 He said, “[it was] an absolutely beautifully executed forced or emergency landing by an unbelievably well-trained pilot.” The hyperbole is suspect, but, for now, we have no choice but to believe that Harrison Ford is a good pilot with appropriate instincts under duress. Where is the fun in that? Yesterday, a confluence of events led denizens of the Internet to believe Kanye West’s laptop had been stolen. A G.O.O.D. music artist, Malik Yusef, tweeted and since deleted, “We have the PRIVATE INVESTIGATION FIRMS ON TOP OF @kanyewest STOLEN LAPTOP!!!! !” At the same time, a new song from Kanye leaked. It’s called “Awesome,” and it features a lot of AutoTune and piano chords. Given the tweet and unexpected track, people of the music Internet believed the song emerged because of the leak. It was a leap of logic that probably would not hold up in court. A Def Jam executive quickly clarified these were discrete, coincidental events. Chloë Sevigny is speaking out for a quiet but passionate minority. Not all people find Jennifer Lawrence endearing. Shocking as it may be, Sevigny told V Magazine that she finds J-Law “annoying. Too crass.” Sevigny prefers Angelina Jolie: “I love when a movie star is a great movie star. I think Angelina Jolie is a great movie star.” I’m guessing Sevigny prefers actresses who date famous older men while they’re still actively married, not when they’ve just consciously uncoupled. Fair enough, Chloë. At this point, any story about Shia LaBeouf is believable. One the one hand, there’s a whole website dedicated to him sitting in silence. Yet, there’s also this video of him acting like a caged animal. He traffics in the fantastic and the banal. But does he do pedestrian? His girlfriend Mia Goth was photographed with a large rock on her left ring finger — the appendage typically adorned with engagement rings and wedding bands. If Shia were to do true, everlasting love, I think he’d elope to Reno (Las Vegas is far too normcore). It’s difficult to see him entertaining the protracted process of wedding planning, but perhaps romance is his weakness. Do the conventions of modern love draw him back to the middle, to the mainstream? Truth and time will tell all.